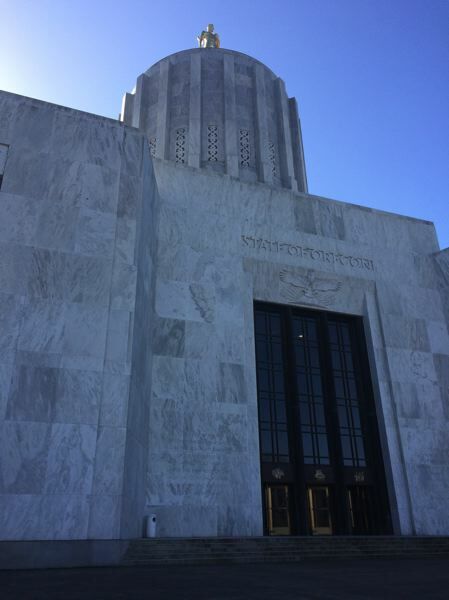 Here's our round-up of Oregon lawmakers' unexpected ideas for the 2019 legislative session. Cap-and-trade — rent control — and new firearms restrictions. Oregon lawmakers have set an ambitious table for the 2019 legislative session — but whether the result will be feast or famine is unclear, even considering the Democratic supermajority at the statehouse in Salem. With about 1,500 bills under consideration, there's plenty of potential law-making that could fly under the radar. But remember: just like "Schoolhouse Rock" instructed back in 1975, it's a long, long journey from bill to law. With that in mind, here's a look at five relatively lower-profile bills that could still make quite a splash. This news might get your tail wagging — a trio of Oregon lawmakers want to prohibit landlords from tacking on extra fees for renters with furry friends, otherwise known as pet rent. House Bill 2683 would prohibit one-time, monthly or other periodic charges for tenants who possess a pet. The bill, chiefly sponsored by Portland Democrat Rep. Rob Nosse, is up for debate in the House Committee on Human Services and Housing. Electric scooter scofflaws have become the bane of some Portlanders, who say riders aren't following rules banning the two-wheeled contraptions on sidewalks, in parks or for users without a helmet. But an uncovered cranium would no longer be a punishable offense if House Bill 2671 becomes law. The proposal by Beaverton Democrat Rep. Sheri Schouten would require protective headgear be worn only by riders of motor-assisted scooters under 16 years of age. The bill has been referred to the Joint Committee on Transportation. Would you allow hospitals to sell your personal health care information — as long as you got a cut of the cash? Currently, almost all medical data is protected by federal standards created in 1996 by the Health Insurance Portability and Accountability Act. Senate Bill 703, however, would let Oregonians be paid for their "de-identified" health data. Under the proposal, patients would have to sign paperwork authorizing care providers to sell their anonymous health data to third parties. SB 703 would also make it unlawful to discriminate against consumers who don't want to monetize their most intimate details. The bill has 40 sponsors and resides in the Senate Judiciary Committee. Rep. Bill Post, R-Keizer has suggested Oregonians adopt year-round daylight saving time. That would mean perpetual summer time, as well as an end to the twice-a-year readjustments to clocks and sleep cycles. Voters would get to weigh in too, as the bill stipulates that the proposal would be referred to the next general election if the bill is signed into law. Even if the voters consented, the change would still require federal approval. The change to permanent daylight saving time would then go into effect at 2 a.m. on Nov. 7, 2021. House Bill 2297 currently in the Rules Committee. Lawmakers may decide to ape an eco-conscious measure recently implemented in Portland. Senate Bill 90 would make it unlawful for restaurants across Oregon to provide patrons with a "single-use" plastic straw unless the consumer specifically requests one. SB 90 has already survived an initial public hearing, and has a work session scheduled in the Senate Committee On Environment and Natural Resources on Feb. 7. Straws made from paper, bamboo, pasta, sugar cane and other materials would not be covered by the bill.